“Four graphically inclined small presses that hope to make a splash at this year’s Toronto Comic Art Festival”. Guess what? We did it! The latest (and already popular!) novel of Editions Tchai – Rock Testament – finally arrived from print house. It’s even better than our pilot version we did last year – it’s twice thicker, printed on better paper and has nicer cover color. This is the whole cinch of printing a big run offset. This book we going to present at TCAF in about two weeks. Just in case you didn’t know: TCAF is The Toronto Comic Arts Festival, a week long celebration of comics happening in the city of Toronto. 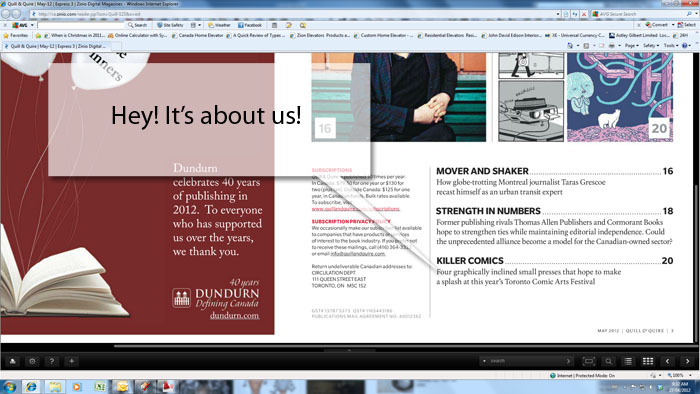 We going to have our booth at TCAF where we will sit, sell our books and draw dedications. First box already empty. Hurry up! But no worries – there is always time for the tea. This book (and many others) will be still available at our ETSY shop until something good happens. Coup de pouce – Eugene Zhilinsky. Toronto Comics Art Festival | TCAF | Books. Just have a look at these great selection of this year’s TCAF book debut! We’d like to have and read almost all of them. Well… at least one among them we know very well already. It’s our Rock Testament! One of the shelf at Beguiling comic book store. With our books – Hungry Heart and Rock Testament in front. And Toronto Graffiti cards too! 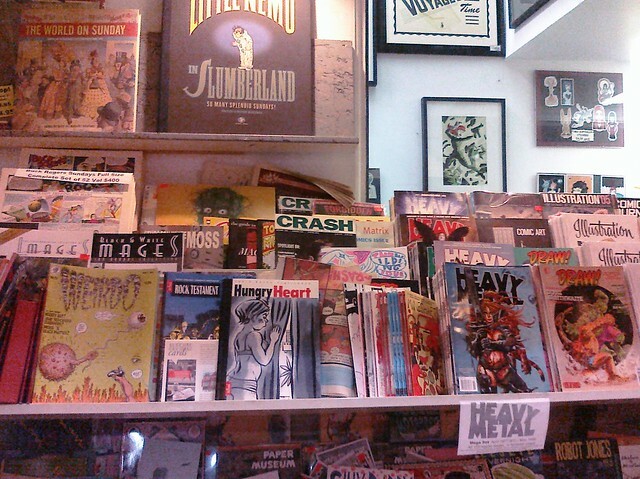 Still in a good company – Heavy Metal on the one side and Little Nemo above.